Royal has now been here for a month and it’s like he has been with us forever. He is completely ensconced in our home and lives. He and Orso get along almost like they had been litter mates. 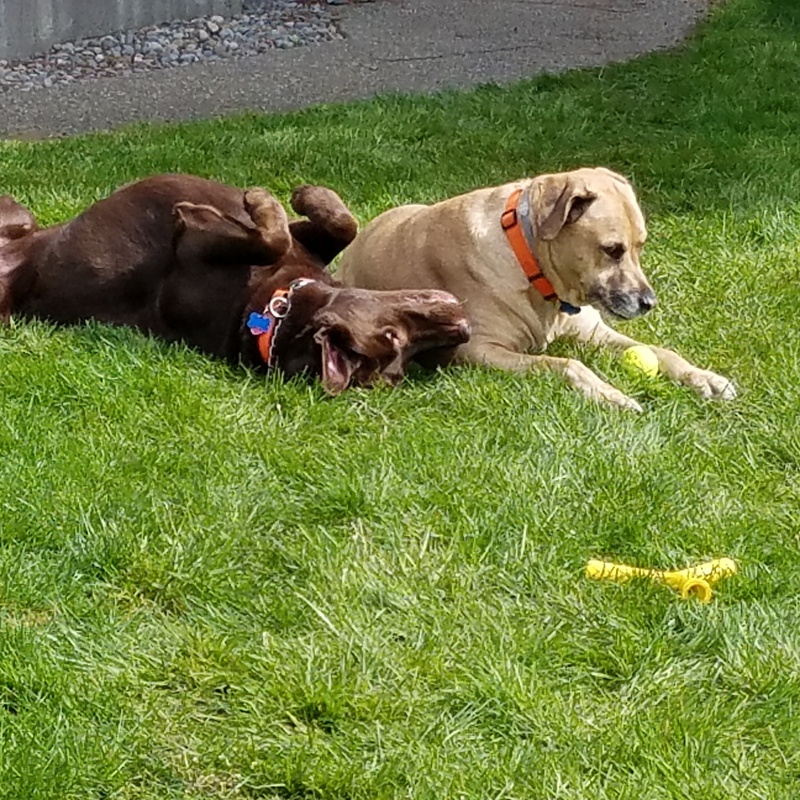 Both are consummate couch potatoes with short bursts of energy, running side by side full steam nipping at each other, then dropping on the grass rolling around on their backs settling on their stomachs to watch what I’m doing. There are no fights or tension, it is so pleasant, just two dogs that have the same temperament. A real breath of fresh air. Not to pretend Royal is perfect, he is not. He has no sense of personal space, getting right in my face wanting to lick me all over (yuck). I’ve seen what they put in their mouths. Try putting your shoes on and playing dodge ball with your head in an attempt to avoid dog kisses. I can bob and weave like a pro boxer now. He walks crooked, partly because of his hip dysplasia, which is quite annoying on our walks. He must walk on my right, won’t walk on the left, so I’m left to walking in the middle of these two buffoons and Royal walks into my right leg pushing me into Orso. Then he crosses in front of me to go sniff and pee. After he is done sniffing and peeing, he crosses back to my right, but this time he crosses behind me. So I’m constantly circling the leash around my head like a lasso. I am pretty sure the neighbors think I’m nuts. What else is new? We were told Royal gets along well with cats, but I’m not so sure about that. He has gone ballistic barking and growling at the neighbor’s cat walking across the back fence. He chased that cat the length of the yard along the fence line and I don’t think it was to introduce himself to the neighborhood. He also has no fondness for squirrels. He wants one badly and I fear the day he and Orso outsmart one. Not that I love squirrels, I just don’t want to watch the bloodletting and subsequent visit to the vet. Bedtime means all of us in our bed. We lost that battle three dogs ago. Now we just accept the cramped sleeping space and constant dog hair. I keep the bed and pillows swathed in sheets to keep our faces free of dog hair and other dog parts. The top of the bed is no-man’s land, but under the comforter the sheets are dog free. Of course the added bodies make the bed hotter, so I keep a fan blowing on me year round. Poor Mitch has to sleep in his shorts, sweatpants, t-shirt and sweatshirt, plus in the winter he has two comforters on him, even with the dog body heat. I’m glad we took the chance and brought him home, he is the perfect match for Orso. And I do get a kick out of walking two dogs that weigh right at a hundred pounds. You should see the faces of the people I walk by with their five pound dogs barking up a storm and mine are actually behaving. (Of course when they don’t I look like a boat anchor dragging behind them). Just to show you I am not making it up, I have a picture of the two laying in the yard. Next Post Oh Come on Now – Enough is Enough! I’m glad to hear Royal is fitting in so well! Royal might be like Choppy with the cats – ones Choppy knows she is completely fine with, but she still loves to chase ones she doesn’t (and sometimes ones she does know get a little chase, just to see if they’ll run). That could be what it is. Orso has always loved cats even though most are a little concerned about his size. I would get a cat if Mitch wasn’t allergic.